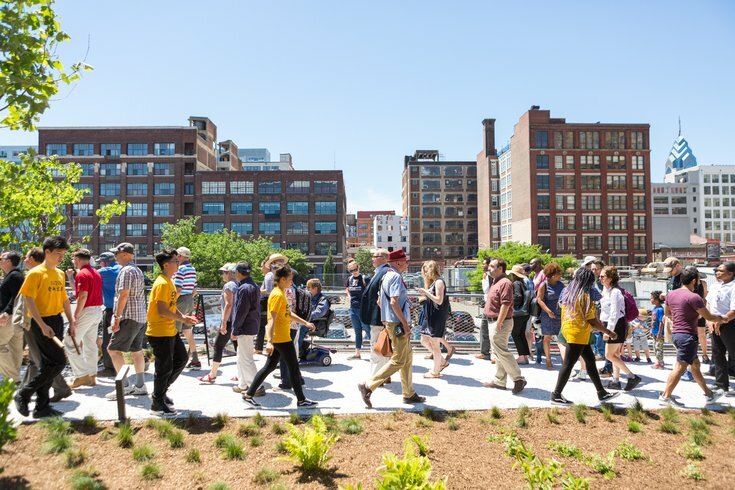 Phase One of the Rail Park is located in the Callowhill neighborhood and utilizes the land of the former Reading Viaduct. Now you'll be able grab a drink next to the entrance of Philadelphia's new Rail Park. Boxcar Beer Garden will open at 5 p.m. today, July 11. The pop-up is the latest from FCM Hospitality, the group behind Morgan's Pier, Harper's Garden, Concourse and Parks on Tap. RELATED: PHOTOS: The Rail Park officially opens | Philadelphia Zoo launching happy hour series "Wild Nights"
On the menu is a rotating selection of beer and wine, as well as sandwiches and sides. A portion of all proceeds generated will benefit the nonprofit Friends of the Rail Park. Expect picnic tables and twinkling lights in the space, which will have a backdrop of the "Stamp of Incarceration" mural. Boxcar Beer Garden will be open 5 p.m. to midnight Wednesdays and Thursdays, 4 p.m. to midnight on Fridays and 1 p.m. to midnight on Saturdays and Sundays. To enter the beer garden, you must be a member. You can quickly sign up online for free, or at the host stand when you arrive.